1818 N. Humboldt Ave. Photo by Michael Horne. 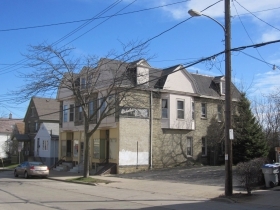 The heirs of Josephine Michalak (1917-2010) have finally sold their mixed-use building at 1818 N. Humboldt Ave., according to a tenant who was given a 28-day notice to vacate the apartment she has occupied for 24 years. According to Danielle Champagne, a seamstress, as recently as March 30th she had been assured by the Michalak heirs that the building had not been sold. “But on March 31st, a notice was slipped under my door informing me of a change of building ownership and that I had a month to move.” Champagne’s task is complicated by a need to find a place for her work tables, sewing machines and the other accessories with which she plies her traditionally home-based trade. According to Champagne, the 5,456-square-foot building, constructed in 1894, was sold to Zach Eberhardt, who did not respond to a message requesting a comment for this story. A record of the sale has not been found in a document search at this time. 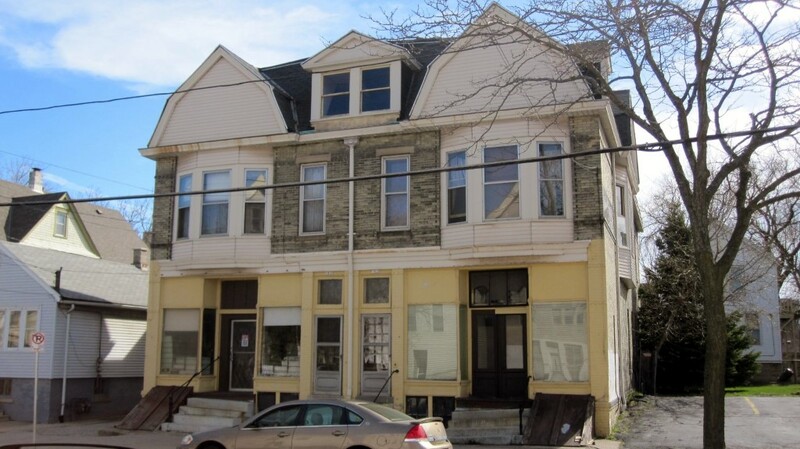 The building, which sits on a 9,295-square-foot lot, is assessed at $330,000. Eberhardt, 35, has worked since January as the Purchasing Director at Watercrest Investments. The firm is based in the Astor Hotel, which it owns, along with other East Side properties including the Shorecrest Hotel. His current address is a Brewers’ Hill duplex that he owns. That building has been listed for sale. 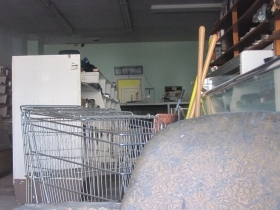 The grocery store was once one of scores of similar establishments on the Lower East Side. Vincent and Josephine Barszcz Michalak took over the operation of the grocery in 1940. Vincent died in 1972, at which time Josephine kept it open (according to her whim and terms) until she finally closed the place after a fall in 1989, when she was 72. 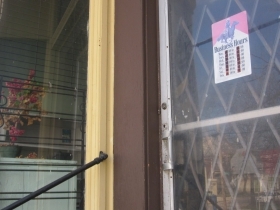 She continued to live in the apartment above for another 21 years, during which time she spent nearly every day sitting in her darkened, closed shop. Champagne remembers signing her lease there with the old lady after the store had already been closed a few years. At Josephine’s death in 2010, she left an estate of $485,285. The probate case remained open for years with the court asking for progress reports from Personal Representative Jerome Michalak, who offered assurances that although the property was for sale, he was not receiving any offers of purchase. (This may have been due to the fact the building was never listed for sale.) 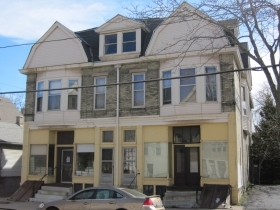 The probate case was closed in 2014, with the building remaining unsold. The building is notable for its striking presence on busy N. Humboldt Ave. one block north of E. Brady St. 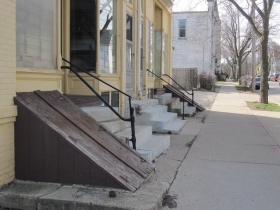 It is built right to the sidewalk on somewhat of a slope, and is outfitted with four separate stoops, and two bulkheads for basement access. Refitting the building to be ADA-compliant will prove to be quite a challenge, at least on the front of the building. The fenestration, including the storefronts, is original, which is rare for a building of its vintage. 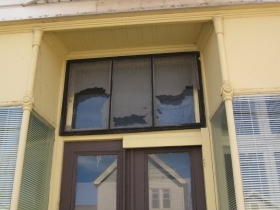 It may be the last remaining historic storefront in the Brady Street neighborhood to have not been rehabilitated, or turned to other uses. I can think of no street-level retail space in the neighborhood that has been vacant as long. Twenty years ago, they were plentiful. As for Champagne, she hopes to find a live/work unit in the area, and also a more generous time frame in which to do so. LaAro, an African boutique that opened in October in a tiny shop at 1415 E. Brady St., has moved west to a larger store a few blocks away at the site of the former Dragonfly, 1117 E. Brady St.
Want More Brady Street News? The Brady Street Area Association will hold its Spring Forum Tuesday, April 11th from 6:30 p.m. – 8:00 p.m. at Casablanca, 728 E. Brady St. Representatives of the Police Department will give a public safety report, and Ald. Nik Kovac will also appear to discuss recent developments with neighbors and interested citizens. Admission is free. Ohhh…that explains a lot. I planned on meeting someone at Thurman’s on Fri. evening, but there was a note on the door saying the bar was closed for a private event. That makes sense, now. I always wondered about that place as I walked by it. I hope it comes back to life in some way. RIP Mr. Lennon. I’ve had some fun late nights in Thurman’s.